Transom Closers (or concealed overhead closers) are normally fitted to the majority of commercial doors, their advantage is that they are hidden in the transom above the doors and are not visible like face fixed or cam action closers. These closers enable doors to open both inwards and outwards and are generally a very reliable product, having been successfully used in the vast majority of installations. The main manufacturers of these products will be Adams Rite, , Axim, Peters Jackson, and others and normally your manufacturer of commercial doors will offer one type as a standard with the option of other makes. is traditionally regarded as the higher quality door closer for aluminium doors, the majority of other closers being manufactured in China. The traditional type of door closer is known as a rack and pinion closer (shown below), which must be used with a projecting scissor arm. 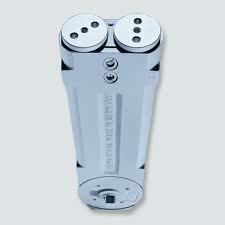 It may be advisable instead to use a cam action door closers instead if you do not want the projecting arm. Cam Action Closers can achieve the requirements of ADM and BS8300* compliance within a greater tolerance than traditional rack and pinion door closers. This is particularly important as hinges and intumescent seals will provide additional resistance to opening and closing. This combination of slide arm and channel with cam action will result in ease of operation by all users, is less vulnerable to abuse and vandalism and will therefore lead to improved life cycle costs. 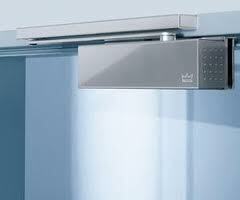 Cam action closers are available in both concealed and visible varieties, and also available with backcheck. Backcheck ensures the safe deceleration and restraint of a door, which has been aggressively opened thereby protecting both the door and the surrounding area.This can be a significant factor in reducing the overall building maintenance cost such as walls, doors and protecting ironmongery as these will not have to be repaired and replaced as often.Most quality closers feature backcheck that allows a door to be fully opened through normal operation without incurring any increased resistance. Should the door be thrown or flung open in an aggressive or abusive manner, backcheck will cushion and arrest the door to prevent damage to any adjacent wall, door furniture or the door itself. 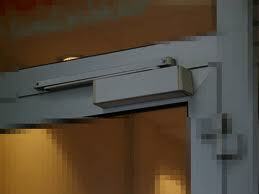 This allows the door to stay open longer and a greater number of people to go through the door before it begins to close.With delayed action, the door is opened and then delays for a set period of time before closing.The delay is adjustable by valve and can be adjusted to suit each application. 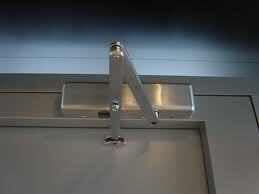 This for example would be useful on a classroom door allowing all of the occupants who would be accessing the door at the same time to either enter or leave the room with just one opening and closing cycle of the door.When this is compared to 20 or 30 individual operations, it would lead to a significant reduction in the life cycle basis. There are also situations where you may prefer not to keep the door closed. When electro-magnetic hold open devices are fitted to doors they dramatically help to improve access in and around any building, particularly in corridors. They allow doors to be held open during normal use and close upon activation of the fire alarm or power failure (fail safe). Once activated, the door closer will close the door and then perform as a normal door closer until the alarm is de-activated or the power restored. Quality electro-magnetic devices listed within this brochure are CERTIFIRE Approved and CE Marked to BS EN1155 (Electronically powered hold-open devices for swing doors).They are perfect for meeting the requirements of ADM and BS8300. In addition they reduce the life cycle costs as the doors are rarely operated other than for periodical maintenance checks, or if the power is switched off at night. When electro-magnetic free swing devices are fitted to doors they allow doors to be operated without the user feeling any resistance from the door closer mechanism. In addition to this they allow the door to be left in any position, performing as if the door had no closing device fitted. Upon activation of the fire alarm or power failure (fail safe) the Free Swing device will close the door from any position it was left in, and then perform like a normal door closer until the alarm is de-activated or the power restored. Quality free swing devices should be CERTIFIRE Approved and CE Marked to BS EN1155. As a free swing door closer operates with no opening resistance it is compliant with the requirements of ADM and BS8300.